Click here to listen to Livia Papadhimitri playing the violin and Sofia Papadhimitri the plano. So this is when the "jamming" begins! 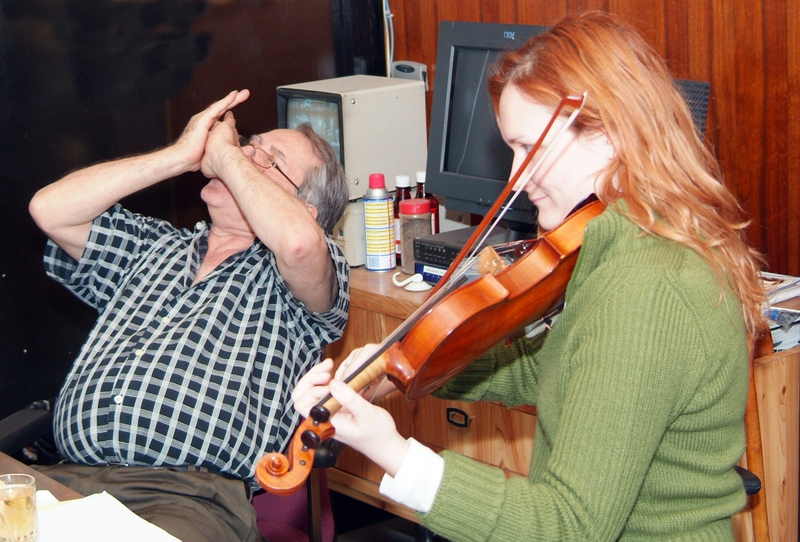 Mr. Goudas takes out his harmonica and Livia her violin and they begin to play their favourite songs. This Musical Duet performance attracts a lot of attention from other employees, who many times request for their favourite song to be played. Even Koukla the dog likes it, who respectively holds her barking until the music has stopped. Mr. Goudas really gets into the music and plays the harmonica leaning back and with his eyes closed (see picture). They both really enjoy being part of this unique combination of instruments. Livia often says "Mr. Goudas might not be a trained musician but he surely has musical talent as well as a natural ability to entertain!" Below is a personal write up by Livia Papadhimitri herself. This article can also be found in " Mr. Gouda's autobiography book". At this point of the book, I believe the reader feels as though they know Mr. Goudas well. For me though, the experience of the completion of this book, was also an opportunity to truly get to know my boss, a person who I thought I knew well, but in fact I didnt know at all. Every day I would come to work, pass by his office to tell him good morning before I went to my office, and in the end of the day, I would pass by his office again to say goodbye. This daily routine went on for years. Only when Mr. Goudas began the writing of his biography and needed my help for the editing, I actually had the chance to get to know the real person behind the brand Goudas Foods. During the completion of the book, Mr. Goudas and I have spent countless hours talking in his office, when his mind was clear from all the daily problems. Often, he has narrated, very spontaneously, different stories about his life. During this period I learned that some of his experiences, were so important that they have truly carved the direction of his life. Others have determined various important characteristics of his personality. There have been many times where my eyes have watered with tears of joy or sadness, following a story he told me. Many times I have been surprised with his honesty, as well as his bravery to open his heart with no fear or hesitation. The same honesty is incorporated in this Biography, because Mr. Goudas wanted to touch the readers heart, but also show him/her, in his own words, who is the real Peter Spyros Goudas and how his life has evolved until now. I would like to add something, that maybe has been mentioned previously in the book, but has not been emphasized enough: Mr. Goudas heart. I have never met a person with such a big heart and generous soul in my life. I admire Mr. Goudas that he managed to accomplish his goal to place his whole life in a book, with truth being number one priority. My general conclusion from this whole experience is that there is not one boring story in his life. He has lived a life just like a movie, full of interesting events and never with a dull moment. The most exciting part of it all, though, is that the stories of his life never end, and personally, I can,t wait to hear the next story he will narrate to me.